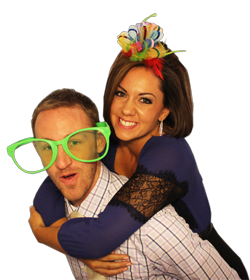 For as long as you have the photo booth at your event (typically 3 hours) you get unlimited prints the entire time. Multiple prints will be printed (so everyone gets a strip or print). If you are having a scrap book, an extra copy will be ran to include in your book as well. 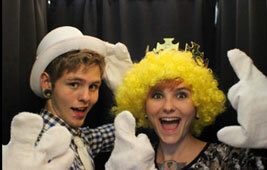 With our photo booths, unlimited really means UNLIMITED. Everyone gets a strip or picture to take home with them EACH time they enter the booth. 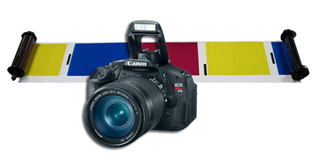 High speed, high quality pictures print out in just seconds after each photo session has ended. We have an online planner that you complete before your event, which allows you to add custom text to your prints, choose your font and even choose your background color! Album/Scrap Book is made out of white fabric with a silver metal frame in the middle. The pages are white 8"x8" 2 sided. 20 pages (10sheets) are included as well as plastic sheet protectors. Also included is 2-sided tape and metallic silver markers. Wedding albums only. 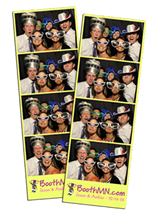 The photo booth operator / attendant takes care of everything for you! Delivery, set up, testing and take down is all included. After the event, you will receive all of the originals (individual) photos that were taken as well as all of the imposed strip files that are ready to print! 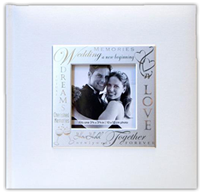 You can then print any extra pictures or prints that you want and share them with whomever you want. Guests can choose which color option they prefer before the photo is taken. Upon request by the client booking the event. You must request this ahead of time. 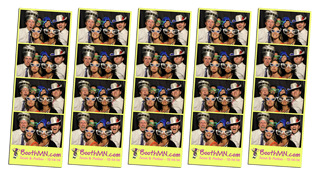 Not only does the booth attendant / operator deliver, set up, test and take down the booth, but they also help your guests use the booth the entire night! They help to make sure everyone knows how to use the booth and fix any issues that may occur. We have an online planner (questionnaire) that we have you complete so we know all the information we need for your event. The planner allows you to customize the prints / strips. You can choose the text, font and even the background color of the prints. Our booths are built with professional grade camera's and professional, high quality (dye sublimation) printers. They also will last a very long time. Prints are dry and ready to handle as soon as they exit the printer. Our booths are not the small, cram 2 people in uncomfortably and quick take the picture and get the heck out of there kind of booth. You can easily fit 5 or more people in at a time. Each guests stands so it is a lot more comfortable. Our booths are automated and easy to use. There are instructions and it is all ran by a computer or tablet. Each group can even view themselves before the pictures are taken. PLUS, the attendant is there to help anyone that needs it. 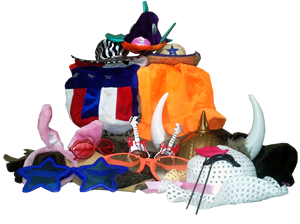 As a standard service, we include many props with each booth. 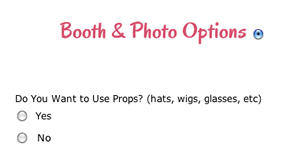 Hats, wigs, and glasses are among some of the standard props with each booth. As long as you or the venue can supply wifi (wireless internet), then we can setup our booths to allow your guests to upload and post pictures to facebook and other social media sites. You must request this ahead of time. 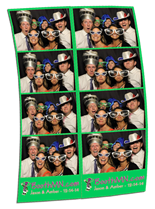 We can create custom prints to meet your event. All of our prints are on 4x6" sheets of paper. 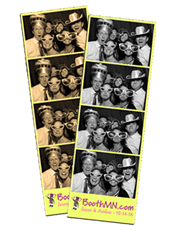 We can add logos, custom artwork to the background and completely customize the size and position of the photos. After the event, we can post all the photos and print files online. 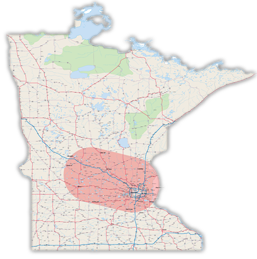 We travel the entire state of Minnesota, but as you can imagine, we need to cover our time and gas to make some of the longer trips. Contact us for more info. We have found that 3 hours is plenty of time for a 250/300 guest event. Most people can use the booth more than once in this time. What is the size of the strips? Each standard strip it 2"x6". How many strips are printed? As many as needed so each guest gets a strip and 1 can go in the scrap book. How long after the pictures are taken does it take for the print to come out? The prints come out just seconds after they are taken. Each print (4x6) takes 15-45 seconds. Yes! 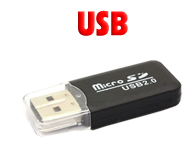 You will receive all the of the original photos and print files on a USB drive that you can keep! Also, if you are having a scrap book, 1 strip / print will go in the scrapbook if the guest leaves it. It is an album style book with plastic page protectors. Your guests can tape a strip into the scrap book and leave a message for you next to it. We provide markers/pens and tape. What kind of camera and printer is used? Our booths are built with professional grade camera's and professional, high quality (dye sublimation) printers. The prints last a very long time. Prints are dry and ready to handle as soon as they exit the printer. Is there an attendant to take care of the booth? Yes an attendant / operator is there the whole time to help guests and keep the booth running smooth. How many pics can be taken? It depends on which option/options you choose. With the "typical" strips , each group takes 4 photos per session. 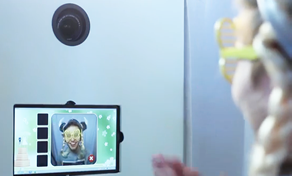 Guests can revisit the booth again and again if time allows. The total number of pictures that can be taken in a night is never the same. Each group takes a different amount of time in the booth. It takes some longer than others to choose props and get ready than it does others. People stand in our booths and they can squeeze in past the curtains even. So 5+ can easily fit. Yes, it has a very easy to use touch screen with instructions and guests can even see themselves on the screen before the pictures are taken. PLUS, the attendant is there to help anyone that needs it. Each booth takes about 4 feet by 8 feet and is 6'5" tall. When should the booth be open? 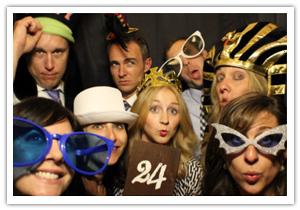 At a wedding or similar event, you may want to open the booth during the social hour so your guests have something to do. Many have the booth open for an hour before dinner and then open it again after the first dances of the night.